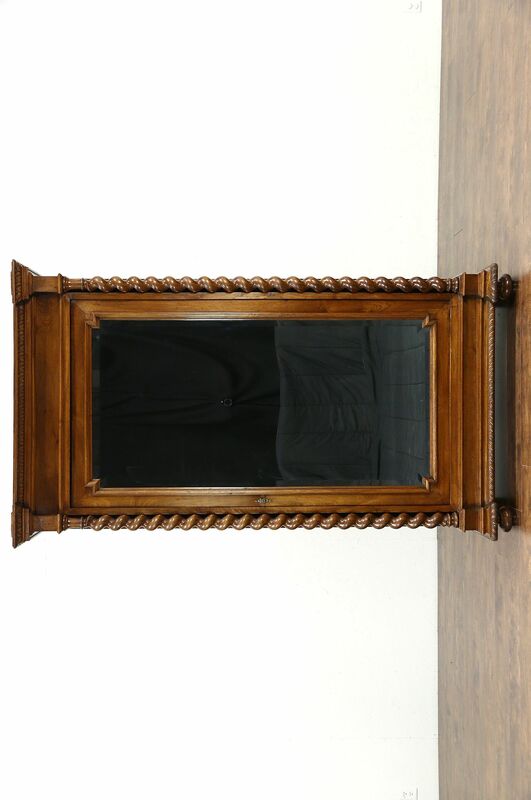 A spectacular classical armoire, wardrobe or closet was hand carved in Italy about 1900, and has an original beveled mirror with shaped corners. Solid wormy walnut, there are spiral columns, medallions and deep sculpted moldings. Minor shrinkage separations from age give a little antique character. The original finish is very well preserved and has been waxed and buffed, so all that is needed to maintain the warm patina is an occasional wipe with a soft dry cloth. A working lock has its original face escutcheon. The interior has a drawer and closet pole and could be fitted with shelves if desired. This historic furniture does not disassemble, so care must be taken with measurements to deliver. Dimensions are 49 1/2" wide at the crown, 25" deep and 88 1/2" tall.